Stores Ref. 22c/167. The frame is in excellent condition with virtually no paint loss and only minor marking. The nosepiece leather and backing chamois are both good '+'. The rubber facepads are original but as usual are hard and crusty. Fortunately the shape of the pads isn't too bad. Fitted with a very good pair of clear lenses. The large loops forming part of the strap are good but stained. Some of the stap springs appear to be broken/disconnected but the appearance is still quite good. 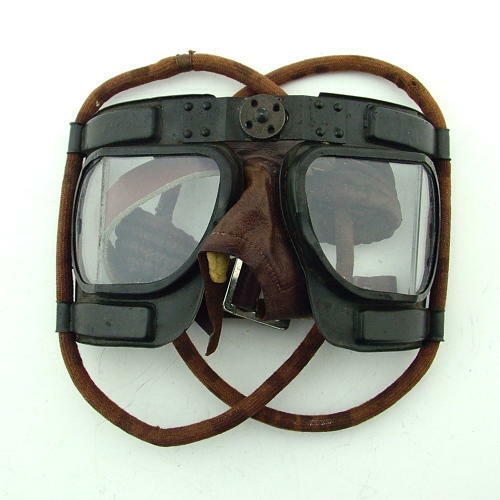 The leather strap is very good with clear Air Ministry markings. No flipshield fitted. A good pair. Stock code G18762.